Police released graphic body-cam footage on Tuesday in connection to an shooting in Los Angeles that left an armed suspect and a hostage dead last month. The video, recorded on June 16, showed Los Angeles Police Department officers as they responded to a call about a suspect, later identified as Guillermo Perez, who had reportedly stabbed his ex-girlfriend moments earlier, according to police. Responding officers arrived to the scene in Los Angeles’ Van Nuys area at around 1 p.m. to find Perez standing outside a church with a metal folding chair and a large kitchen knife in his hands, according to the footage. This still image taken from a body camera video released by the Los Angeles Police Department shows a Los Angeles Police Officer confronting an armed suspect in the Van Nuys neighborhood of Los Angeles on June 16, 2018. Perez approached the officers as soon as they exited their vehicles and ignored repeated commands to “drop the knife,” the footage showed. The officers said they fired “less-lethal” bean bag rounds at him to de-esculate the situation, but he blocked the shots with the metal chair, according to police. 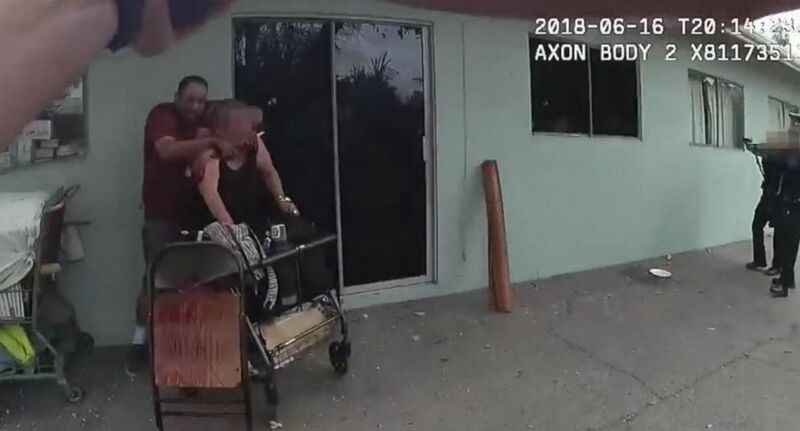 The graphic video shows that as the suspect runs away from the officers he grabs an innocent woman, 49-year-old Elizabeth Tollison, taking her as a hostage before putting the knife to her neck. “Perez then pushed the woman in between himself and the officers, raised the serrated knife, and pressed it against the woman's neck,” the police department said in a statement Tuesday. “At this point three officers fired their handguns at Perez who was hit by the gun fire and fell to the ground. “Tragically, Perez's hostage was also struck by gunfire, collapsed and later died from this gunfire,” the statement adds. LAPD Chief Michel Moore said it had been 13 years since an officer's gunfire had killed an innocent bystander or hostage. 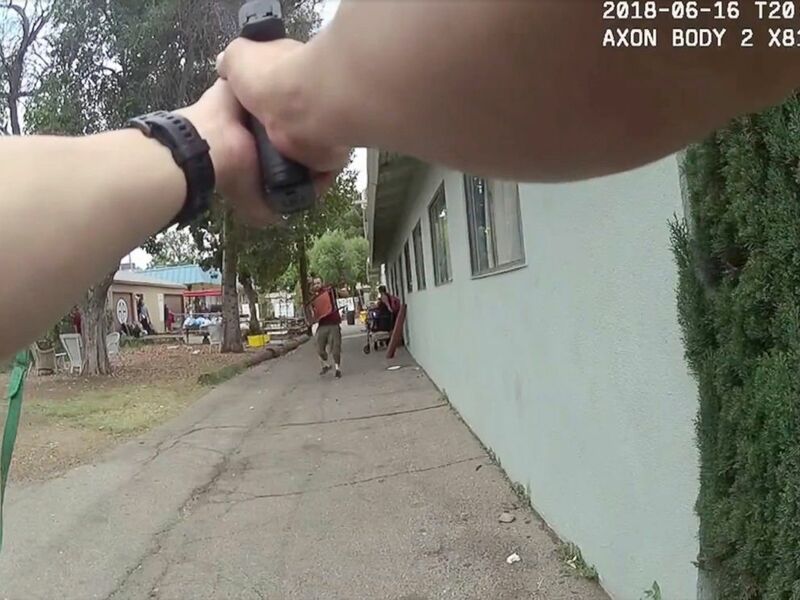 Police in Los Angeles released graphic body-camera footage on Tuesday in connection to an accidental shooting incident. The “three officers shot at Perez to stop his actions and prevent him from killing the hostage," Moore said at a Tuesday morning press conference. "The life of the hostage is paramount and protecting that individual from the threat of the assailant, and in doing that, the balancing act that the officer has -- is how to protect them by stopping the suspect's actions." He said the department plans to implement a new training program and hopes to equip officers with other nonlethal weapons. "This was a tense situation that unfolded very quickly. It's every officer's worst nightmare,” Moore added.